Trying to figure out what looks best with it. Are the red pants too much? 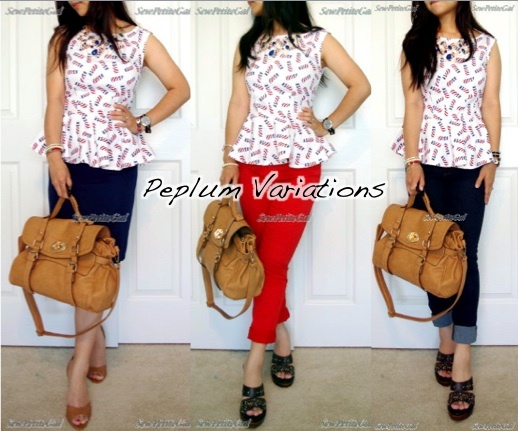 Do you think peplums look better with skirts or pants? Love the peplum. Your ability to whip on-trend pieces that look great never ceases to amaze me. I think I personally like the look of peplums with skirts... Something about peplums just makes me think of lady-like skirts. I am loving this top! I want one ! I like it with both skirts and pants. Nice job! I always love your DYIs. The blouse is beautiful. I love the peplum paired with the pants :) Great DIY SPG ~ and on trend too! You do indeed love nautical! And peplum is so on trend! I love the top with all the bottoms! And I LOVE DIY leather bracelet. Do you have a link to the project? Can you make me one pretty please? You're are so talented. The top is super cute is looks greats in all three outfits. I can't wait to see the print as a dress on baby Erin. Aw, thanks Ying! I'm afraid my sewing isn't yet good enough for others but I hope it will be someday! I personally like a peplum with a skirt. I don't know why. I haven't really considered peplum to be a good shape for my body. It's a hit or miss kind of thing. Really great job! I need to learn how to sew better. My sewing skils are limited to cushion covers and pillow cases. And they don't look very good either. I'm just in awe that you could just whip something up like that. I've never considered peplum for myself but I love it on others. Love it! And love it with red the most! How amazing that you can add your own twist with the trend. hey, you! hope you had a nice wknd. i've been looking for the perfect peplum... and you did an amazing job w/ this. certainly a better choice than a skirt, imo. :) the first look is my fave... because the shoes are a good balance and contrast with the bottoms you have on. but all three are great. just saying if i had to choose, lol. i absolutely love your necklace, and the fabric choice is just perfect! I've enjoyed wearing peplums with pants and skirts so I'm for both! 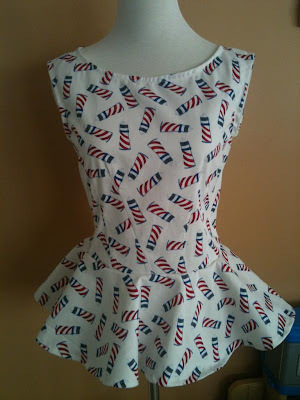 Love your Nautical Peplum DIY, gorgeous! gosh you can really sew girl! i love the last look, how you pair it with dark pants. I actually don''t own any peplums at all and mostly bc i dont think i would look right in it. boo. Oh my gosh, hun! I love the DIY. So freakin' cute. :) I'm a peplum lover myself and have sewed a few. I adore the print on this one you made. Hope you have a great Friday and cheers to the weekend! Yippee! Love the peplim blouse, is amazing! i think it works either way, but i do love it w/those cuffed jeans. i dont think the red jeans are too much either. this is seriously just as good as the H&M ones!! can we see babe E's uniform using this mat'l?